Toronto, Ontario--(Newsfile Corp. - February 6, 2019) - Crown Mining Corp. (TSXV: CWM) ("Crown" or the "Company") is pleased to announce it has staked an additional 35 new federal mining claims adjacent to the Engels Mine in the Light's Creek Copper District, in Plumas County, northern California. These claims were staked to cover potential extensions to the high-grade ore that was mined as an underground operation in the early 1900's (see Figure 1). 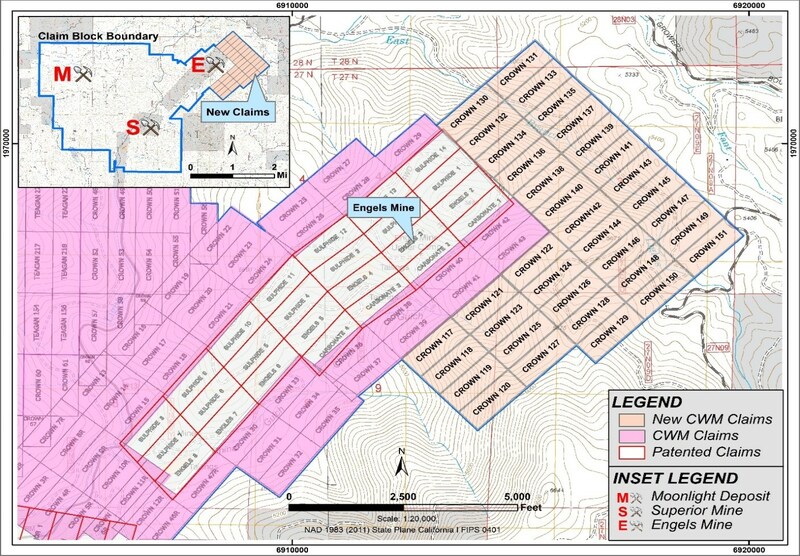 Crown's decision to expand its tenement position was prompted by reviews of historical data indicating that the copper (silver) grades at Engels are open in all directions. The newly staked claims lock up the interpreted extensions or potential repetitions of copper-silver mineralized zones at Engels. The Company's landholdings now total 12 square miles of contiguous patented and unpatented mining claims that cover the Moonlight, Superior and Engels deposits - which have inferred and/or indicated resources - as well as several partially tested and untested exploration targets. Commenting on the importance of this development Crown CEO Stephen Dunn, said: "Historical reports on the underground mining activities at Engels indicate early miners focused on the highest-grade sections of the ore body, ignoring material that graded below 1.5% copper. Reports, maps, drill logs, and historic resource calculations recently reviewed by our team show copper (silver) mineralization at Engels extends well beyond the historic underground mine workings and the Company's previous land holdings opening the potential for an open-pit type deposit that could add significantly to the economics of the Moonlight Deposit (PEA details below). Securing these additional claims is an important milestone for the Company and is part of our ongoing strategy to create value at Light's Creek Copper District. We will continue to advance that strategy, and once the funding is in place, initiate exploration development programs to fully define the potential of this exciting copper district". Crown controls approximately 12 square miles of patented and unpatented federal mining claims in the Light's Creek Copper District in Plumas County, NE California; essentially, the entire District. The District contains substantial copper (silver) sulfide and copper oxide resources in three deposits - Moonlight, Superior and Engels, as well as several partially tested and untested exploration targets. The Superior and Engels Mines operated from about 1915-1930 producing over 161 million pounds of copper from over 4 million tons of rock containing 2.2% copper with silver and gold credits. After-tax NPV of US$179M at an 8% discount rate and a $3.15 copper price. Please note the PEA is preliminary in nature and includes inferred mineral resources that are considered too speculative geologically to have the economic considerations applied to them that would enable them to be categorized as mineral reserves. Furthermore, there is no certainty that the preliminary economic assessment will be realized. Mineral resources that are not mineral reserves do not have demonstrated economic viability. Readers are encouraged to read the technical report. Further details of the PEA and the resources on Crown's property and the parameters used to calculate them can be found in the "Technical Report and Preliminary Economic Assessment for the Moonlight Deposit, Moonlight-Superior Copper Project, California, USA" dated April 12, 2018 on both the company's website at www.crownminingcorp.com or on www.sedar.com under the Crown Mining Corp profile. This press release contains forward-looking statements within the meaning of applicable Canadian and U.S. securities laws and regulations, including statements regarding the future activities of the Company. Forward-looking statements reflect the current beliefs and expectations of management and are identified by the use of words including "will", "anticipates", "expected to", "plans", "planned" and other similar words. Actual results may differ significantly. The achievement of the results expressed in forward-looking statements is subject to a number of risks, including those described in the Company's management discussion and analysis as filed with the Canadian securities regulatory authorities which are available at www.sedar.com. Investors are cautioned not to place undue reliance upon forward-looking statements.